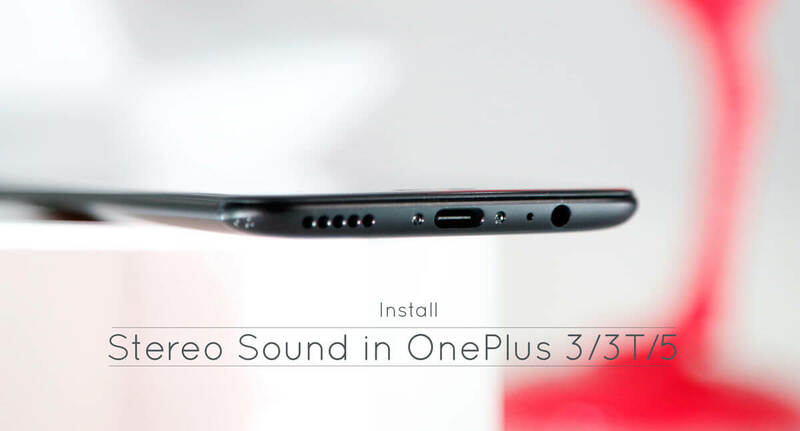 Many Oneplus fans felt sad when they came to know that latest flagship Oneplus 5 has only a single speaker, missing out on stereo speakers. With launch of iPhone 7/7 Plus, Apple ditched the 3.5 mm jack and went on with Dual stereo speakers. Also, Upcoming Samsung Note 8 is expected to come with Stereo speakers, leaving Oneplus 5 behind. Though the Sound Quality of single Oneplus speaker is not that bad, we are really missing out on stereo music effects. But don’t worry, we have a simple trick which can mod the front earpiece of Oneplus 5 and Oneplus 3T to use it as a speaker for playing music, videos etc. While the sound from earpiece may not be much loud, it is always great to have dual speakers amplifying the sound. Let me guide on doing this. This method has one limitation. I am sorry for unrooted users, you should have a rooted OnePlus 5/OnePlus 3T with a custom recovery installed. Rooting a flagship device like OnePlus 3T/OnePlus 5 can be really advantageous. They both have a great Android community, featuring amazing developments of MODs and ROMs. So, if you are interested in rooting your Oneplus device, follow our detailed guides on How to root Oneplus 3T and Oneplus 5. A rooted Oneplus 3T/ Oneplus 5 with any custom recovery. Caution: This method was tested on Oxygen OS 4.5.5 version and should work fine on other versions as well. Follow at your own risk. Download the Oneplus 3T/Oneplus 5 Stereo mod.zip, according to your device. Transfer the downloaded file to the Internal storage of your device. In the main menu, Tap on Install option. Navigate to the location of zip file and then Select it. Swipe right to confirm the flashing of zip file and wait for the process to complete. At last, Reboot into the system. On successful reboot, Play some Music and you must hear front earpiece sounding the track. In case, you want to revert to the Stock Sound, then Download and Flash a suitable revert zip for your device. For TWRP, you can follow the same flashing process as described above. That’s it. Pretty much simple right? We hoped you liked this Speaker mod and don’t forget to share your experience in the comment section below. Also, Visit our 10 best apps for rooted devices 2017 edition to get the maximum out of your Flagship device. Top 5 Best Custom ROMs for Oneplus 5.